The highest praise I can muster for Nvidia GRID is that I sometimes forgot I was even using it. That’s no small feat for a cloud gaming service that streams high-end games to low-powered devices over remote servers. Other efforts, such as OnLive, constantly remind you of the journey its games must take from server to client, with rampant stutters, slowdowns and resolution drops. Nvidia GRID rarely has those problems—at least when the conditions are right. 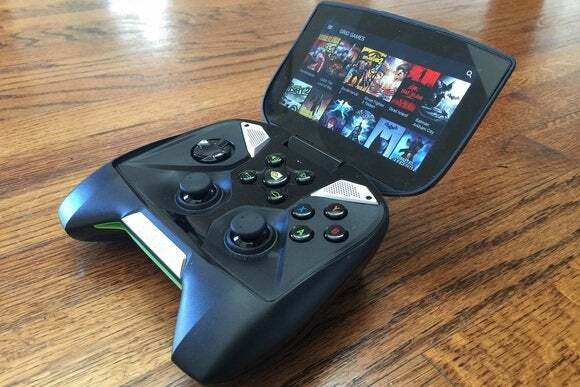 Nvidia has been beta-testing GRID with Northern California residents for about a year, but in November the service opened up to anyone in North America and Western Europe with an Nvidia Shield handheld or Shield Tablet. From now until the free preview ends on June 30, 2015, users can access GRID at no charge. While there are only 30 games currently, Nvidia has been adding at least one new game every week (though usually two). While I don’t recommend buying a Shield device for GRID alone—especially not until we know what it will cost after the preview ends—it’s proof that streaming PC games can really work. After years of prognostications about cloud gaming that have never quite panned out, GRID is an exciting proposition. Accessing GRID games is straightforward on Shield devices. 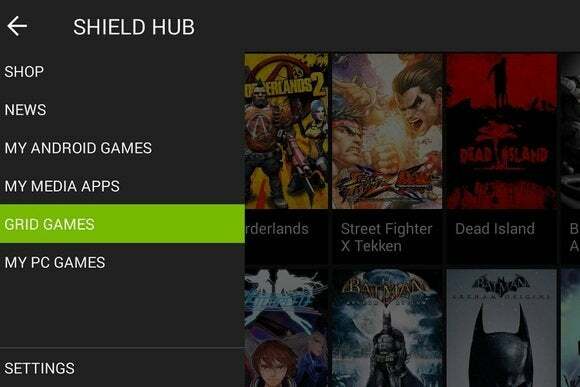 You just launch Nvidia’s Shield app and navigate to the GRID section. You have to create a login and password—though you can authenticate with Google or Facebook instead—and after that, you’re in. 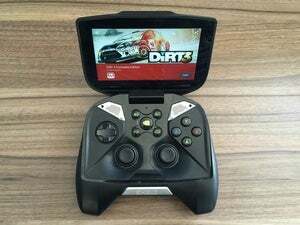 GRID games are just a tap away in the Nvidia Shield app. Tapping on a title takes you into the game, but not before Nvidia tests your connection. If bandwidth is under 9 Mbps or ping is over 150 ms, or if Nvidia detects too much jitter or frame loss, a warning message will tell you to use a different router. (You can, however, ignore the warning and continue playing at your own peril. More on this shortly.) Once you get through this section, Nvidia takes a few more seconds to get things ready, and then launches the game as if it were playing straight from a PC. The catalog is sparse and leans heavily on older games, and you won’t find anything from Activision or EA, but it does include some hits such as Borderlands 2, all three Batman: Arkham games, Darksiders 2, Psychonauts, and The Witcher 2. A handful of indie games such as Stacking, Trine 2, and PixelJunk Monsters also make an appearance. It’s certainly enough to keep you entertained for many hours. I tested GRID under three conditions, all on the Nvidia Shield handheld I purchased earlier this year: the 5GHz band of my Netgear N750 wireless n router, the 2.5GHz band of the same router, and wireless tethering to AT&T’s 4G LTE network from an iPhone 6 Plus. Each condition produced markedly different results. The 5GHz connection was by far the best, allowing 60 frames per second in most games and only minor, occasional stutters. I was able to line up headshots in Borderlands, take first place in a round of Dirt 2 racing and execute special moves with ease in Street Fighter X Tekken. Dropping down to 2.5 GHz didn’t make games any less playable, but it did scale me back to 30 frames per second for all titles. GRID only buckled under 4G LTE tethering, which showed a “Wi-Fi error” message when I tried to launch a game. You might be able to power through some easier games this way, but you’ll deal with stutters, freezing and bouts of input lag along the way. You can still stream with a weak connection, but don’t say Nvidia didn’t warn you. Speaking of input lag, Nvidia hasn’t completely vanquished it, even under the best connection I could muster. GRID is a bit laggier than streaming from a networked PC with Shield’s GameStream feature, which itself is a bit laggier than playing directly on your computer. The lag is generally not a problem for racing games and beat-em-ups, but it makes shooters a little more challenging. I should also note that I did most of my testing in the same room as my router. Stutters and choppiness became a bigger issue as I wandered into areas where Shield’s Wi-Fi icon showed a weaker signal. While you’ll probably be able to enjoy GRID when visiting friends or family—provided they have a decent wireless router—it’s going to work best when you can ensure a fast, dual-band connection. Hotel and in-flight Wi-Fi is likely out of the question. Though I’m impressed with the quality of GRID overall, it does have a few drawbacks and limitations. Because GRID is a purely online service, any interruption to your connection means the end of your gaming session. 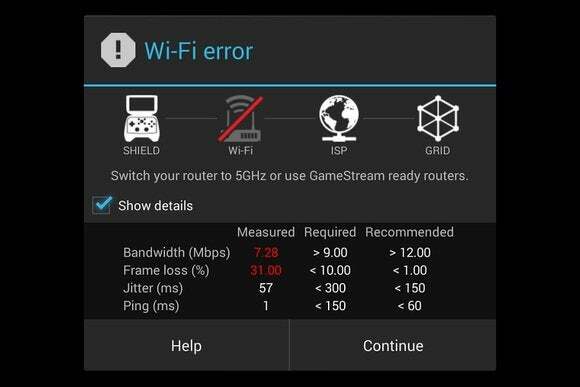 Should you lose your Wi-Fi signal, GRID has no way of remembering where you were in a game, so you’re back to whatever checkpoint you’d saved at previously. Equally frustrating is the way GRID may sever your connection if you step away for too long. I learned this the hard way while pausing Borderlands to help shuffle some cars in our driveway. By the time I got back, GRID had kicked me out due to inactivity, erasing all of my progress since the previous checkpoint. Strangely, I haven’t been able to reproduce this issue—in one instance, I left a game running for more than a half-hour with no disconnection—which makes it all the more vexing when it happens. Also, GRID doesn’t support online multiplayer in its current state. The games themselves will show multiplayer options in their menus, but will give you error messages when you try to connect. 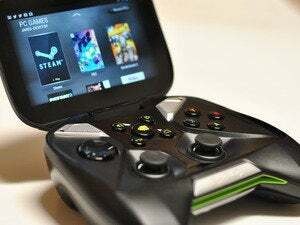 It’s unclear whether Nvidia will be able to hook into existing multiplayer services like Steam in the future. After spending a few days with GRID, I’m starting to wonder how much I really need Nvidia’s GameStream service, which streams my desktop’s PC games to Shield over a local Wi-Fi connection. For many games, tapping into Nvidia’s servers works nearly as well, and it allows the PC to be off, disconnected or in use for other purposes. Unfortunately, we have no idea what kind of service GRID will become once the free preview is over. It could be a subscription service, or one where you pay to lease games for certain periods. Maybe Nvidia can hook into Steam for access to your existing catalog and save games, or maybe GRID will continue indefinitely as a free service. Right now, the company isn’t giving any clues. So if you do have a Shield handheld or tablet and plan to use GRID, here’s my advice: Pick a GRID game or two that you know you can finish in the next six months, and that you won’t mind losing from your collection thereafter. Enjoy the free service while it lasts, and marvel at what it might become in the future—but don’t get too attached.